I'm roasting a lamb shank and an egg or two to prepare for our Passover Dinner this Thursday night. 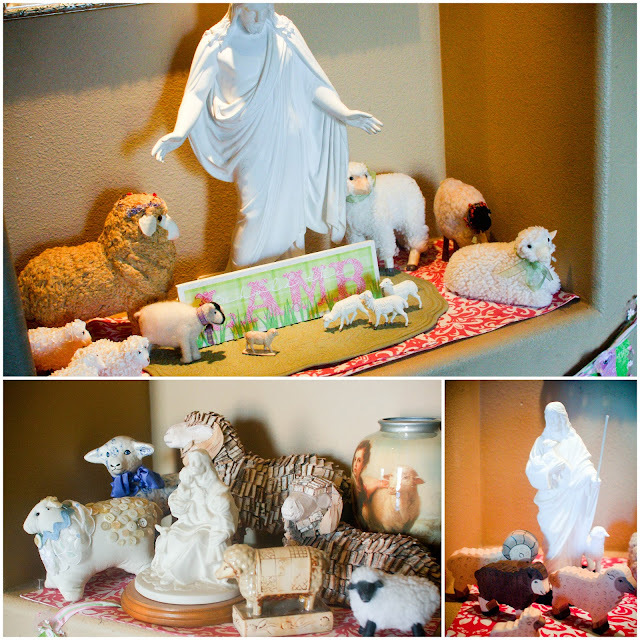 It is one of our favorite and most spiritual Easter week traditions. We do our own version the the Jewish Seder ritual where we discuss not only what the lamb shank, matzo, bitter herb, etc. symbolize Jews, but also how each of the foods and other parts of the Seder relate to Jesus Christ. It is really remarkable! We do it outside, by candle light, and we follow it with a dinner of foods that Christ would have had during his time. Even with the little ones, the spirit has always been strong, and now that they are older, we can go deeper, and they remember more. 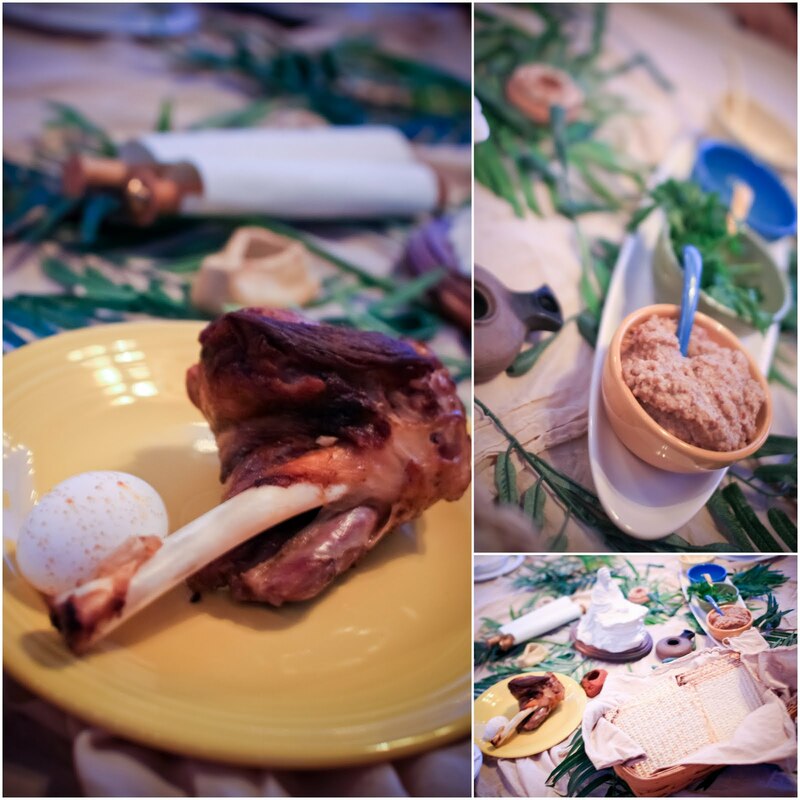 Here is the link to my previous post about our Passover Dinner. You can do it as simply or as complicated as you like. Do more research if you like, but this post will get you started. Speaking of lambs, I also have been building a collection of lambs that I display at Easter time, rather than the customary Easter Bunnies. The Lamb is my very favorite symbol of Christ at Easter. Not only is the the perfect Lamb of God, but he is also the Good Shepherd. I love my little flock of lambs, and every year, when I pull them out, I think of how much our shepherd loves us. Here are some little lamb tags that I made simply with different paper punches. The white paper was put through and embossing folder in the Big Shot to give it a fluffy texture. Then punched it out with a large scallop circle punch for the body. I then punched out another one, and used the same punch to punch a smaller section out of the side of the scalloped circle to make the fluffy hair on the head. The head is a large oval punched from black, and the ears are a small oval cut in half. The legs are the window label punch cut in half. Then just add a small gingham bow on top. So cute and so easy - if you have the punches. And then on Easter Sunday, we always make a lamb cake. I have had this lamb shaped cake pan for years, but was intimidated by it. 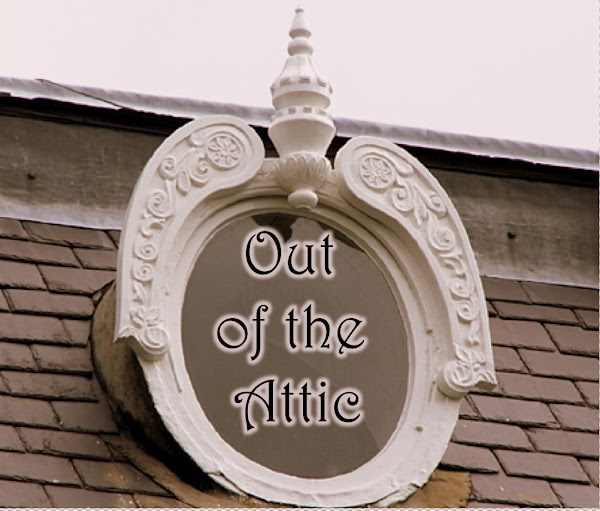 A few years ago I did this, and I thought it turned out darling. I baked a devil's food cake, and piped on vanilla frosting in big loose swirls everywhere but the face and ears. I sprinkled green coconut "grass" all around her. The flowers are made from large marshmallows that I snipped in half with scissors and sprinkled with colored sugars which only sticks to the cut parts. The leaves were made the same way. The centers of the flowers are my favorite Easter treat - Cadbury Mini-Eggs. Very easy and such a pretty way to finish off our Easter meal! 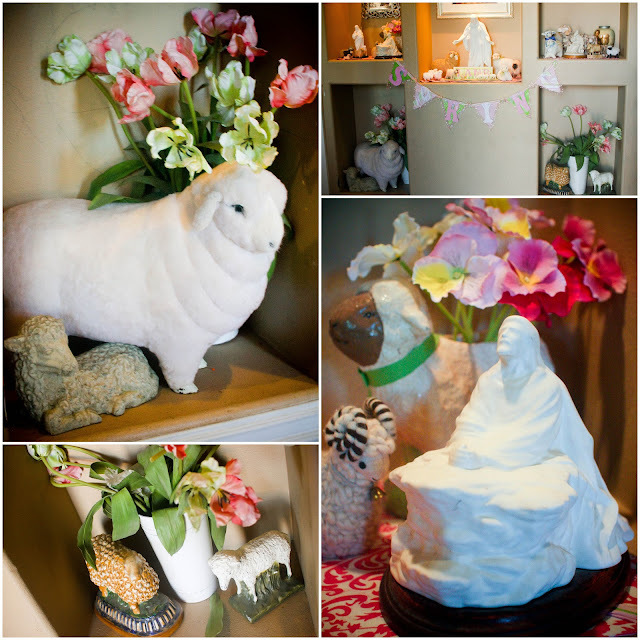 I hope you find lambs as enchanting and as meaningful as I do this time of year, and that some of these ideas might help your family "Behold the Lamb"just a bit more this sacred Easter season.